Carpets simply enhance the interior beauty of any household. But it is very annoying when this piece of aristocratic decor becomes dirty and unusable. 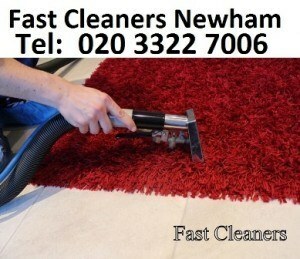 Fast Cleaners Newham is here to take you out of such problematic situations. Our cleaning company provides deep cleaning for any carpet, irrespective of the material. We do not use bleach for cleaning as it ruins the natural lustre of the carpets. Basically, the method implemented is steam cleaning where out expert professional cleaners utilize only tap water to produce superheated dry steam. The temperature is tremendous which enables cleaning and sanitizing any carpet to its original condition in very short span of time. Our specially trained cleaners utilise technology oriented machinery which easily cleans any dirt, grease, grime or chemical film providing amazing cleaning results. The steam cleaning removes any bacteria or fungal clot even though the surface remains dry. Use of professional machinery saves time of clients and cuts down the annual budget of cleaning. Unnecessary to invest in cleaning solutions, buckets, mops or traditional cleaning equipment. All cleaning services imparted by us are proven to kill 98% of dust mites and neutralise the allergens associated with it so as to aid the allergy and asthma sufferers. We provide a healthy, ecological and cost effective way to clean. The rug cleaning cost starts at £65.00 plus VAT. We secure all cleaning services to ensure comprehensive client fulfilment. Both dry and wet cleaning systems are available with us. Avail our discounted cleaning prices and discuss your cleaning details with our agents. Call us on 020 3322 7006.